Guitar Lessons Include: Chording, strumming, fingerpicking/fingerstyle, and applications to a variety of folk, pop, rock, and country songs. Fingerstyle guitar solo playing is offered. Simple music theory is explained as it applies to lessons. Lead guitarists are introduced to rock chording and picking techniques, pentatonic and complete scales, modes, and common rock and blues riffs. Mastering the guitar neck as a whole is stressed. Eric brings many years of experience as a guitar instructor, and more recently, as a ukulele instructor. 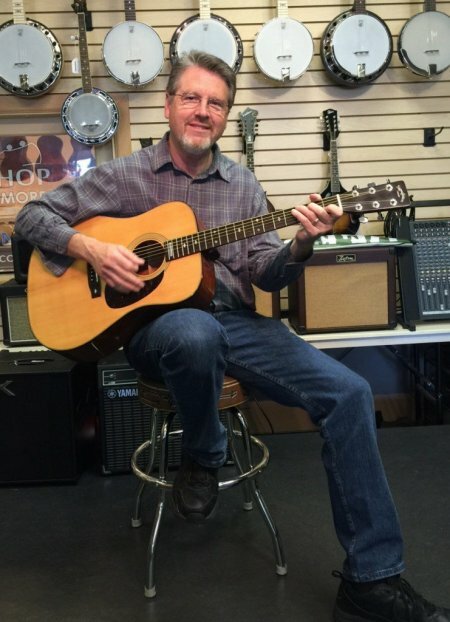 He has formerly taught for the Music Box of Lodi along with other music stores in Sacramento. He has been involved with music instruction to adults through the Elk Grove Community Parks and Recreation program, the Creative Connections Arts Academy in the Twin Rivers School District, and Sierra College Community Education. Composing original guitar compositions is one of Eric’s interests. He earned a Bachelor of Arts at CSUS. He holds a multiple subjects teaching credential with the State of California. He retired from public school teaching in 2012.